Dogs and kids, do they mix? Is it possible to have both? Are they mutually exclusive? Yet another child has been killed by a family dog, this time it was a Jack Russell Terrier. The child was only a week old. The horror stories always make the press. I am not going to comment on the tragedy as I haven't got any of the facts. There are a huge number of families out there with dogs and kids who get along great. It is a shame when things go wrong, but follow some golden rules and everything should go well. 1. Never leave dogs and children in the same location and unattended. If you go to make a cup of tea take one of them with you, it's a great time to get in some training with your dog while the kettle is boiling. Think of the dog as a burning candle, you wouldn't let your child play in the same room as a naked flame with no supervision would you? 2. Never think that the dog has to learn to deal with it. Do you enjoy your child climbing on you all the time, pulling your hair, standing on your feet, trying to drag you around? Do the other members of your family enjoy it? Why then should your dog have to learn to put up with this from a child? Even the best behaved dog has off days and could snap, causing fright or injury. 3. Make sure your dog has an appropriate diet. Some dogs are effected by their diets as much as some children are. Your dog should be eating a diet that is based on meat and is colouring free. Check the label on your commercial food, how much meat is in the food? 4% in the meaty chunks is not enough! 4. Make sure your dog has been properly trained. Find a trainer who uses reward based training methods, preferably one that has been through some sort of registration process so that you have back up if they do something wrong. Ask for advice and act on it! Reward based training is not permissive but it gives the dog guidelines with positive outcomes for doing what is right, a bit like parenting, giving a gold star or a lollipop when the child behaves appropriately. 5. Make sure your dog has enough play and exercise. Like children a tired dog is a good dog; but a stressed one from too much play and exercise is fractious. Find activities the whole family can enjoy. Going out to the park? Why not take the dog along? All dogs are different, some will play ball until they drop (= stress = fractious) but most will just enjoy hanging out with the family. 6. Give the dog its own space. If your dog has somewhere it can rest, knowing it is not to be disturbed then it is more likely to take itself off there to get away from it all. 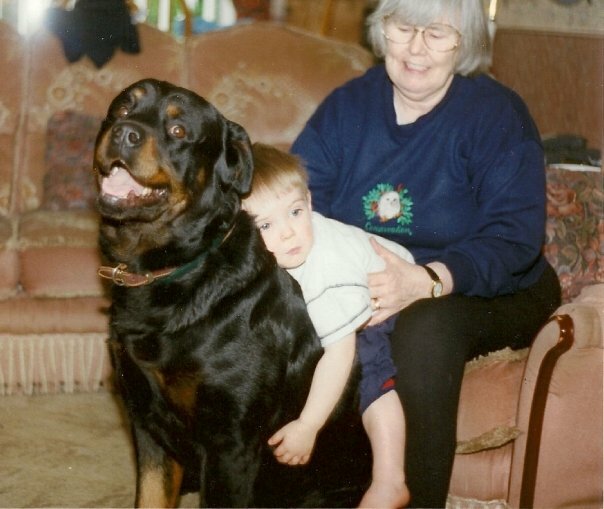 Not trying to sound old here, but when I was young the dog was part of the family, we had rules such as no dogs upstairs or on the furniture, but with 4 children there was probably enough mess. Where the family went the dog went, within reason, not to the supermarket, but yes to a walk in the woods or to a pub (usually with a garden but once upon a time dogs were allowed in family type pubs). I hardly ever see dogs being walked now, except on a Sunday at a local park if it's not raining. I very rarely see whole families out with the dog enjoying being together. It almost seems as if the dog is a chore that has to be seen to. If you choose to have a dog make sure it's part of the family and is used to being around your children and their friends. If you are just about to have a baby, get the dog used to what will be a new routine before the baby comes along. Have a doll as a baby substitute so the dog learns what your boundaries and rules are long before you bring a little bundle into the house.